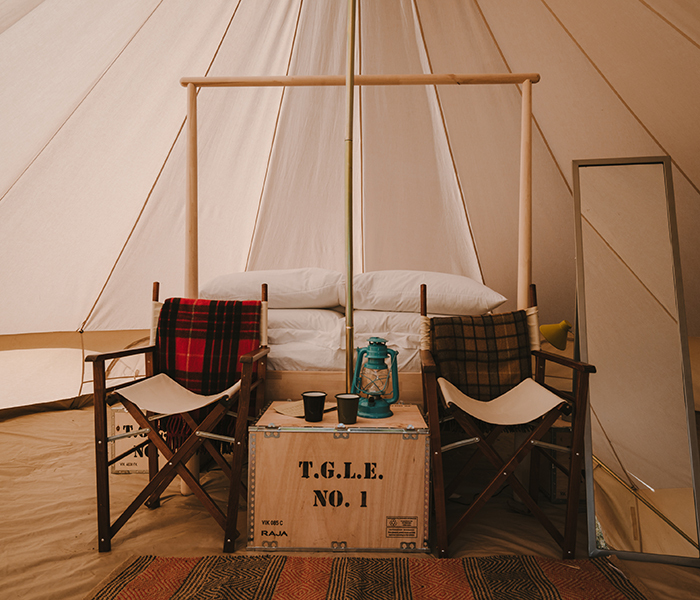 2018 saw TGLE offer a glamping option for the first time. We wanted to get things right from the start, so initially limited numbers to a small group of tents. 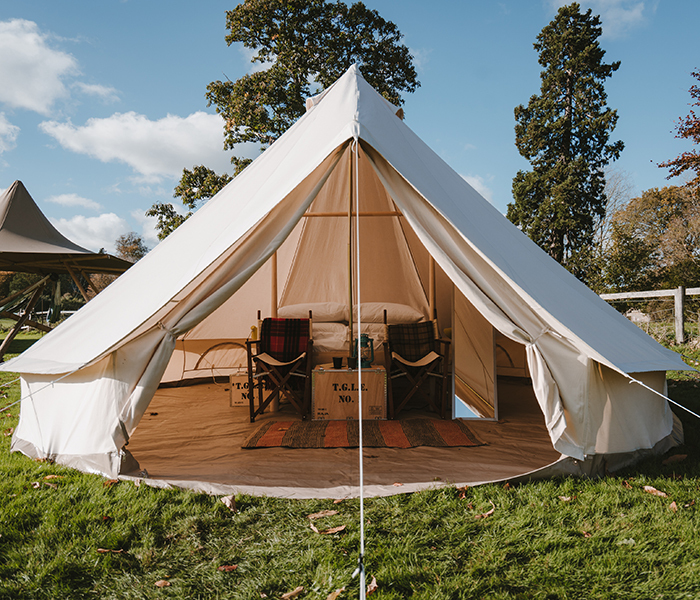 With demand far outstripping supply, this year we have added another handful of these wonderfully equipped bell tents so more of you can enjoy camping -in style- at TGLE 2019. Each large bell tent will have a proper wooden double bed, mattress, sheets, duvet, blankets, 2 directors' chairs, a bedside table and lamp, plus proper showers and loos will be close by all weekend. The glamping bell tents can include up to two camp beds for children, with sleeping bags supplied, as well as your double bed. Guests will enjoy a daily bed-making service and phone charging facilities. Our glamping area will be in a secluded spot with its own security person. You'll be able to park nearby, and -of course- have simple, speedy access to all four corners of the festival site. From The Lake to the Farm Shop, everything is within a 10 minute stroll... even with a cocktail in hand! If this all sounds like your cup of tea, it pays to claim your pitch early. Our ticket tier system means the earlier you book, the more you stand to save. And with just a few spots left, these may not be around much longer. Aside from our glamping tents, we also have 4-man and 6-man bell tents available for weekend hire. Each beautiful, simple bell tent comes equipped with groundsheet, camp beds and lantern. And, of course, we have great camping spots for all those bringing their own camping kit to TGLE. Make the short walk from either car park, pick your top spot, and set up camp for a weekend of music, food, talks, workshops and The Great Outdoors. We see camping as a big part of the experience at The Good Life. Over the course of two or three days a small community of like-minded individuals come together to embrace the good times on offer across the festival site, from wild swimming and fire walking to tent-peg-lending and communal toothbrushing. If you're planning on joining us in 2019, we recommend going all in on the experience and staying on site for the full weekend.